Published in Sociological Theory and Criminological Research: Views from Europe and the United States, edited by Mathieu Deflem. Amsterdam: Elsevier/JAI Press, 2006. Also as pdf. Please cite as: Deflem, Mathieu. 2006. “Introduction: The Bearing of Sociological Theory on Criminological Research.” Pp. 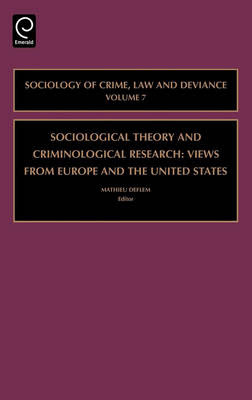 1-6 in Sociological Theory and Criminological Research: Views from Europe and the United States, edited by Mathieu Deflem. Amsterdam: Elsevier/JAI Press. Modern criminology is unthinkable without the contributions of sociology and sociological theory. Yet, not all criminology is sociological in orientation and, far more troublesome, not all sociologically minded criminological work is resolutely and thoroughly grounded in theory. The chapters in this book address various ways in which insights from sociological theory have been helpful in the contributing authors’ criminological research. Revealing the global reach and nationally distinct variations in the practice of sociological theory and criminology, this volume is explicitly trans-Atlantic in terms of its contributors and the topics and theories they discuss. No discipline has made a greater theoretical contribution to the research domain of criminological research than has sociology. Of course, the birth and development of criminology is historically rooted in systems of knowledge that were intimately connected to the practical and administrative demands of criminal justice policy (Pasquino, 1991; Foucault, 1978). But it is likewise the case that modern criminology as it has matured towards an independent scholarly activity is firmly grounded in sociology and other social-science disciplines (Garland, 1992). The triple alliance of criminology, criminal statistics, and police that existed during the early days of the criminal sciences has thus been replaced in serious social-science scholarship on crime and its control by an alliance of theory, methods, and research. It is the role of theory in this nexus in the area of criminological sociology that this volume is devoted to. The authors in this book present chapters that highlight the value of sociological theorizing in their respective efforts in criminological research. The chapters do not merely involve discussions about the ideal value of sociological theory for research nor about the relation between the field of criminological sociology and the discipline of sociology at large. Instead, they present concrete analyses and discussions of how sociological theory has actually been useful to the author’s own criminological research. Presenting this volume, we collectively aim to show that some of the very best criminological work is distinctly informed in useful and varied ways by sociological theory. Not only was criminological thinking until the late 19th century not distinctly sociological, even when the earliest generation of criminologists focused on the social (rather than the biological or mental) correlates of crime, their analyses were not particularly informed by the theoretical insights from the burgeoning discipline of sociology. Most famously, the work of the Belgian astronomer Adolphe Quetelet rested on a simplistic inductivism to construe the perspective of the ‘average man’ (Quetelet, 1835). Because it lacked any serious theoretical inspiration, Auguste Comte thought very little of Quetelet’s work and particularly despised his perversion of the term of ‘social physics,’ for which reason Comte had to cook up the neologism ‘sociologie’ (Comte, 1839). While the sociological classics did not discuss crime and criminal justice as central elements in their analyses of the transformations of modern society, the research domain of criminology was not entirely neglected by the founders of the discipline. Probably best known today is Emile Durkheim’s (1895) discussion on the normality of crime. Yet, unlike his penetrating analysis of suicide in the modern era, Durkheim did not conduct a systematic empirical research of crime, instead merely relying on the category of crime to develop his theoretical argument that normal and pathological social facts can be distinguished on the basis of their average existence in a particular stage of development in a society. While a control theory of criminal or deviant behavior might be developed out of Durkheim’s twin notions of regulation and anomie, and while the notion of the normality of crime anticipates the constructionist perspective of crime and deviance, neither theoretical tradition as exists in criminology today has emanated directly from Durkheim, instead having taken on other theoretical avenues to develop. Probably most thorough of all criminological interests among the sociological classics was the work of Ferdinand Tönnies (Deflem, 1999). Although generally known only for his theory of Gemeinschaft and Gesellschaft, Tönnies wrote 3 books, 22 papers, and 9 review articles on various topics of crime, in addition to 17 methodological papers on criminal statistics. However, Tönnies’s contributions to the sociology of crime have been almost entirely neglected. It would be foolish now, a hundred years later, to try and reconstruct any part of the sociological classics to fit the model of contemporary sociological theorizing in the criminological domain beyond the actual historical lineages that exist in theory development. Yet, what can be observed is that whatever the place was that the likes of Durkheim and Tönnies attributed to crime within the totality of their oeuvre, the theoretical and/or empirical attention they paid to crime was always part and parcel of a comprehensive vision of sociology and an integrated perspective of the relation between theory and research. There is no doubt that the heydays of modern American sociology that came in the footsteps of the European classics have brought about the major stimulus for the development of sociological theorizing in criminological research until this day. I hope there is no bias on my part involved in stating as a matter of fact that the most important initial impetus for the development of a theoretical sound criminological sociology came from Robert Merton’s (1938) seminal article on anomie and opportunity structures. Whatever its merits and limitations, it was Merton’s typology of types of deviant behavior and his theories of anomie and strain that produced a wealth of empirical and theoretical discussions like no other contribution at the time (and arguably since). A close second in degree of influence, although developed already from the early 1930s onwards, were the penetrating works of the early Chicago School of sociology that were focused on the social ills of crime in the urban settings of industrial society. Anticipating the emerging theoretical insights that would later crystallize around symbolic interactionism, the contributions of Clifford Shaw and Henry McKay (Shaw and McKay, 1942) stand out as another important point of departure for research and theorizing in criminological sociology. Emanating from within the Chicago tradition, also, we have a third important building block in the work of Edwin Sutherland and his development of differential association theory (Sutherland 1939). In the period after World War II, criminological sociology underwent a proliferation of theorizing and research that, in its scope and richness, has not been witnessed since and may well never be experienced again. New lines of research were explored and novel insights in theory tested and applied in a pace so fast that even entire book devoted to sociological theory and criminological research, such as ours, can only unravel a fragment of the relevant issues. Importantly, the endeavors in criminological sociology in the immediate post-war era not only took up a central place within the discipline as a whole, but that many theoretical ideas in our subfield were also central to sociological theorizing as such. And it is in this precise sense that our present era is different. Whether or not we agree that the development of sociological research domains into new separate disciplinary areas involves an intellectual Balkanization (Horowitz, 1993), it is clear that criminological sociologists today cannot lay claim to the same centrality in the discipline of sociology --and most definitely not with respect to theoretical developments. What is, in my mind, most tragic about this development is not that some work in criminological sociology today is not well grounded in sociological theory, but that the insights of criminological sociology are also not sufficiently recognized in the discipline at large even on the occasions when remarkable theoretical advances are made in our specialty area. This situation is undeserved and unjust. Serious criminological sociology, as this book shows, relies on and develops sound theoretical ideas and models. And serious criminological sociologists, like the representatives of any another disciplinary subfield, realize that core epistemological and theoretical issues are at stake in how their specialty enterprise and sociology as a whole are constituted. It is in this precise sense that the present volume hopes to contribute to bring theory back into criminological sociology. This book offers no less than ten informative chapters and two commentaries. Written by some of the leading practitioners of criminological theory and research today, the chapters reveal some of the strengths of criminological sociology in its reliance on insights from sociological theory. Because we are fortunate to have two expert commentators for each part of this volume, a brief overview of the contents may suffice. The chapters in Part I deal with various empirical and theoretical issues in criminological sociology revolving around the twin models of macro and micro analyses. Karl Schumann opens the discussions by offering an empirical analysis of the relation between work and crime in the German context from the viewpoint of life course perspectives and insights from Max Weber’s work on the Protestant ethic. Also on the basis of an empirical study, Imke Dunkake investigates school truancy as a form of deviant behavior on the basis of ideas derived from expectancy value theory, Pierre Bourdieu’s capital perspective, and Robert Merton’s anomie and strain theories. Moving to a more distinctly theoretical discussion, Sanjay Marwah and Mathieu Deflem investigate Merton’s anomie-and-opportunity-structures theory from the viewpoint of some of the criticisms that have been raised against this perspective and in the light of one of Merton’s final essays in this intellectual tradition. Ross Matsueda continues the theoretical discussion by investigating the value of certain important ideas in the work of George Herbert Mead for criminological research surrounding the notion of self and the concept of human agency. Karen Heimer, Stacy De Coster, and Halime Ünal move on in a social-psychological direction by contemplating on some of the critical consequences of the socialization into hegemonic gender definitions for juvenile delinquency. Ronald Akers, a leading theorist of criminological thought whose work needs no introduction, concludes Part I by offering a very thoughtful and astute commentary on the preceding chapters. Part II of our volume addresses issues that pose questions of crime in intimate connection with pressing matters of dimensions of criminal justice. As such, our criminological attention is broadened. Nigel Fielding and Joachim Savelsberg both tackle social control issues very distinctly in their respective chapters. Fielding discusses dynamics of law enforcement, especially police training and police culture, from the viewpoint of the formative role of biography, while Savelsberg, in a likewise autobiographically contextualized manner, argues for the value of Weberian analysis on the basis of ideal types in the case of empirical research on sentencing and sentencing guidelines. Next, Robert Crutchfield returns to crime issues in an intellectually informed manner by relating crime problems to the structures of social inequality and social stratification. Susanne Karstedt takes a different route in bringing in emotions in the study of crime and criminal justice. In the best European tradition, René Van Swaaningen again leads us to a broad and high view by tackling important epistemological concerns in criminological thought and practice. Finally, we are fortunate to have Fritz Sack, one of the central players in the institutionalization of German (and European) criminological sociology, conclude our volume by commenting on the chapters in Part II. With Fritz, I hope that readers will have reason to conclude that this volume shows that the works of sociological scholars of crime and social control can be and will be perceived to be sociological in the very best tradition of our discipline. Comte, A. (1839). Cours de philosophie positive. Tome quatrième. Paris: Bachelier. Deflem, M. (1999). Ferdinand Tönnies on crime and society: An unexplored contribution to criminological sociology. History of the Human Sciences 12(3), 87-116. Durkheim, E. ( 1982). The rules of sociological method. New York: The Free Press. Foucault, M. ( 1991). Governmentality. In G. Burchell, C. Gordon, & P. Miller (Eds), The Foucault effect (pp. 87-104). Chicago: University of Chicago Press. Garland, D. (1992). Criminological knowledge and its relation to power: Foucault’s genealogy and criminology today. British Journal of Criminology 32, 403-422. Horowitz, I.L. (1993). The decomposition of sociology. New York: Oxford University Press. Merton, R.K. (1938). Social structure and anomie. American Sociological Review 3, 672-682. Pasquino, P. (1991). Criminology: The birth of a special knowledge. In G. Burchell, C. Gordon, & P. Miller (Eds), The Foucault effect (pp. 235-250). Chicago: University of Chicago Press. Quetelet, A. (1835). Sur l’homme et sur le dévelopment de ses facultés, ou Essay de physique sociale. Paris: Bachelier. Shaw, C.R. & H.D. McKay (1942). Juvenile delinquency in urban areas. Chicago: University of Chicago Press. Sutherland, E.H. (1939). Principles of criminology. Third edition. Philadelphia: J.B. Lippincott. See book overview and complete pdf!